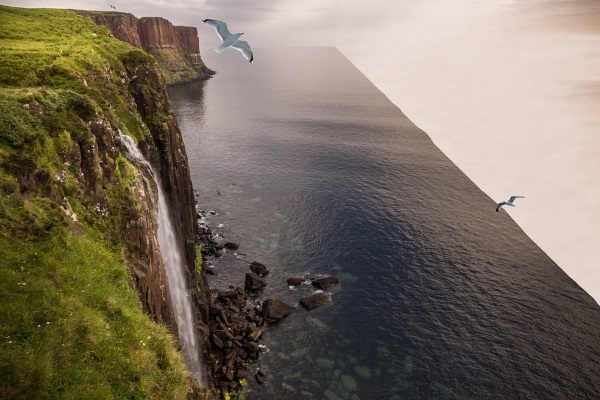 This post has been substantial revisions with additional information about the alleged flat Earth. Every once in a while, Christians and creationists have to deal with comments by owlhoots along the lines of, "You st00pid dumb Xtians believe in a flat Earth." Not hardly! While atheists and other mockers spread this lie (and in my opinion, many know that it's untrue, but do it anyway for the sake of being obstreperous), a bit of research shows that the "Christians believe in a flat Earth" myth is actually a recent invention; Christians didn't believe it throughout history, and most people of antiquity knew the world was round as well. Some may say, "Yeah, but the Hebrew word means 'disc', so it's said to be flat and round like a shield". Of course, such complaints usually come from atheopath sites that indulge in quote mining, and not from people who know ancient Hebrew — it would help if people would do their homework. The above link, as well as the ones presented below, should help give some perspective on this "Earth disc" business. I tend to get a mite riled when misotheists, who reject God and his Word, tell us what we believe. One simple evidence for Earth being round was mentioned by Dr. Jason Lisle in a podcast: time zones. Sunset and sunrise should be at the same time everywhere, shouldn't they? I used to live in southwest Michigan, and I'm now east of there, north of New York City. It's October 8, 2016, and dark outside because sunset is officially at 6:25 PM. Where I used to live, the sun sets at 7:11 PM. That would only make sense on a round planet. Similarly, Dr. James White was mentioning an upcoming trip from Phoenix to New Zealand and Australia. He made a half-serious remark about having "36-hour days" because of 14-hour flights, the International Date Line, and being very busy as well. Such a concept would be impossible on a flat Earth. Unfortunately, there is a small number of professing Christians who are riding for the flat Earth brand. Some of this seems to be motivated by piety, but not on biblical understanding. (There is some speculation that there are atheists pretending to be Christians so they can mislead others and humiliate the rest of us. The concept of deceivers pretending to be Christians is nothing new.) I regret deleting a comment where someone said that he would rather believe the Bible rather than the lies of NASA! Great, he's calling thousands of people liars, including Christians like Col. Jeff Williams. Why many people would have to lie about Earth being round instead of flat, I can't find a good explanation. From my experiences and observations, flat Earthers can be extremely obstreperous and sanctimonious. The first line of Isaiah 40:22 reads, “It is he [i.e. God] who sits above the circle of the earth.” Some have argued from this that Scripture teaches the earth to be a flat disc, rather than a globe. However, even if the original Hebrew is correctly understood to refer to a circle, this doesn’t necessarily indicate something flat; a sphere appears as a circle when seen from above—and indeed from whatever direction it is viewed. Moreover, there is good reason to believe that the word translated ‘circle’ might be better translated ‘sphere’. The Hebrew word in question is khûg (חוּג) which is also found in Proverbs 8:27 where, in many Bible versions, it is translated ‘vault’. For example, the New American Standard Bible reads, “Clouds are a hiding place for Him, so that He cannot see; and He walks on the vault of heaven.” Clearly ‘vault’ carries the sense of something three-dimensional and is given as the primary meaning of khûg in the well-known Brown-Driver-Briggs Hebrew and English Lexicon.1 In modern Hebrew, a sphere is denoted by khûg, along with kaddur, galgal, and mazzal.2 In Arabic (another Semitic language), kura means ball and is the word used in the Van Dyck-Boustani Arabic Bible (1865) to translate khûg in Isaiah 40:22. I hope you get a round to reading the rest of the article, just click on "Isaiah 40:22 and the shape of the earth". Recently-added material follows. Podcast, Is the Earth Really Flat with Dr Jason Lisle (discussing both science and Scripture). Sequel podcast, Does the Bible Teach a Flat Earth with JP Holding (less science, more about Scripture and original wording). Enoch, the Bible, and the Flat Earth (how people take the Bible and the extrabiblical "Book of Enoch" out of context). Six-minute video, Definitive (Observable) Evidence Regarding The Flat Earth, which is also embedded below. Stars Falling from Heaven: Evidence That the Earth Is Flat? Dr. Faulkner shows how misreading of apocalyptic and prophetic passages from a hyper-literal position fails to support flat earth beliefs. January 2019’s Total Lunar Eclipse and the Flat Earth, Dr. Faulkner returns with observations, a bit of math, and material that flat earthers cannot process.